A story I wrote about swapping plants ran in today’s Dallas Morning News. More gardeners are joining up on the Internet and organizing meetings to trade plants, and that’s what this is about. The image above is a grainy one Michael took of the actual paper with his cell phone. I’m in Chicago and haven’t seen it yet. 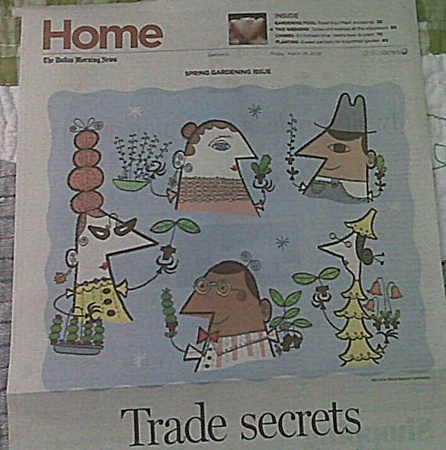 What’s cool about it is that it’s on the DMN’s new style that just came out, and they had an illustrator in NYC create the Picasso looking images of plant swappers! I feel really cool today!! 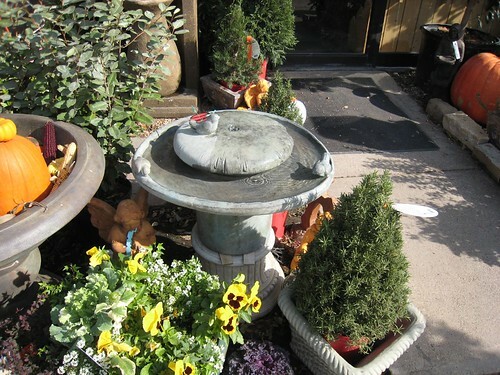 My garden coach recently told me that one of the best ways to attract birds to the garden is with a fountain. Birds need fresh water more than they need seed, and they absolutely go bonkers for moving water. I came across this one on Craigslist for $25. I asked the woman if she’d take $20 but she said no. As you can see it was sort of a bluish black and had lots of white mineral deposits. Upon close inspection I discovered artists tags that said it originally came from Al’s Garden Art. To my surprise and delight it appears that it was once quite expensive. Isn’t Craigslist GREAT!?!? I used a weak vinegar solution to clean the scale. Unfortunately the top part of the fountain with the lily pad broke in half when I was doing this. I could see it had a crack in it beforehand. I had some concrete crack filler in the garage and used that to stick it back together. It appears to be fine now. 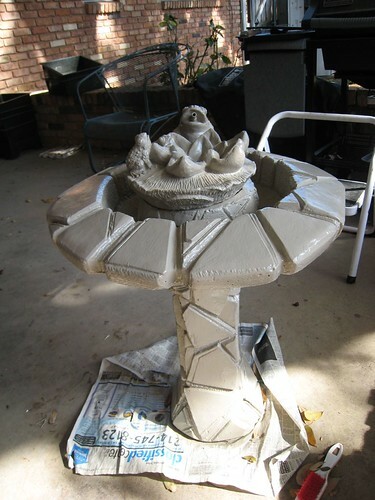 Given that I didn’t like the original color and that the top part now had an obvious seam, I decided to paint the fountain. I used some extra primer and paint in the garage that I had leftover from another project. Benjamin Moore oil primer and oil outdoor gloss. Not the easiest or the most appropriate here probably, but free. Here’s how it looked after painting. Since the piece had such cool sculptural detail, I decided to antique the finish using a gloss product to highlight its variations. I found out about Gem Glo gloss during a lecture by a local faux finisher Michael Graves. He teaches classes. Sometime I’d like to take one. You can read more about him here. Generally I think faux finishes are cheesy but his work is so good I had to change my mind. 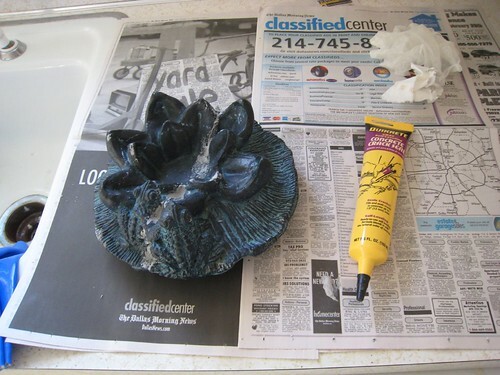 Using a disposable sponge brush I applied the glaze. Then I removed some with cheesecloth bunched into a ball. I sprayed the finished product with a clear matte finishing coat. Voila! Turned out pretty well. 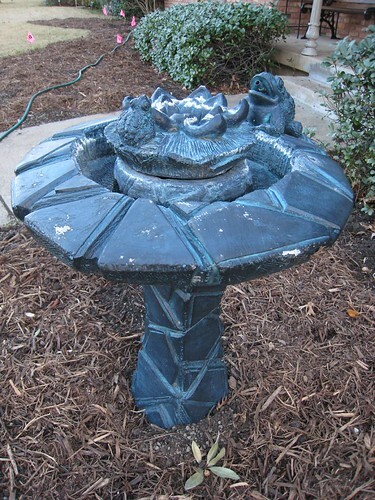 I am going to buy a fountain pump later today and get it going for the birds. 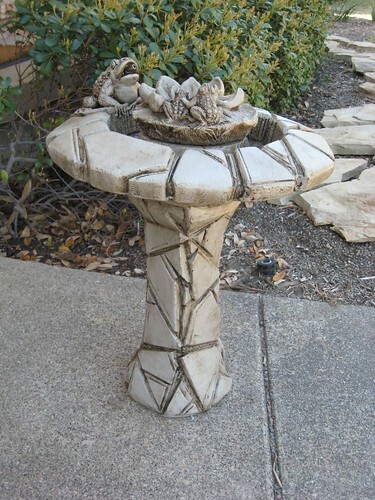 If you’ve fixed a fountain or even just have a photo of a fountain you like I’d love to see it! Please comment. Earlier this week I was minding my own business working in my new raised vegetable bed. It sits behind the garage and faces the alley. Normally it’s a peaceful area with an occasional car or dog walker passing by. But once a week when my back neighbor’s yard crew comes the alley becomes a war zone, a whirling tornado of twigs and leaves loud enough to make you think a freight train were coming down the alley. Three guys on the crew use leaf blowers to scatter leaves out of my neighbors yard and into the alley. Had I not been out there I am sure I would have some leaves in my driveway. I grabbed my earplugs from inside and continued with my planting bed. I looked for some data about blowers, and as it turns out, they are indeed exceedingly loud and I am not alone in hating them. At fifty feet away the decibel level of the average blower is 10 times higher than what’s suggested for safe outside listening, according to nonoise.org. Local governments and municipalities, especially in places like California, are looking to control aspects of the blowers, such as the times they are allowed to be used (please not 7:00 a.m.)! Here’s one recent story about a Boston neighborhood trying to restrict usage of blowers. I think it would also be useful to figure a way to mandate or encourage the use of lower decibel blowers. This piece in Wired suggests that quieter blowers exist, they are just more expensive. Citizens are not allowed to drive around with extremely loud mufflers, why not apply the same sort of thinking to blowers? What do you think? Are you a blower? Do you hire a crew and not worry about it? Does anyone rake anymore? Raised Cedar Potager, originally uploaded by espeedy123. I have a sunny patch out behind the garage that should work great for growing veggies. 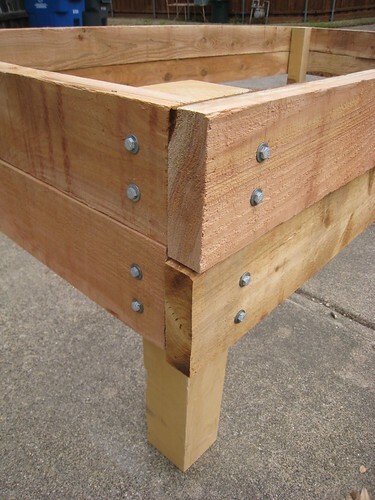 To improve the soil and make the beds easier to weed I am building a raised box frame. I hunted around for awhile for which plan to follow. I wanted something simple that didn’t require a lot of cutting that was also economical. The best option I found was this plan on the Sunset Magazine website. It weighs less and is easier to drill into than some other woods. Because cedar is so great it’s also a bit pricey. The lumber required for this project cost around $90. I considered cheaper alternatives but in the end am really glad I chose cedar because it makes me happy every time I look at it. The wood doesn’t need to be treated with stain if you don’t mind letting it age naturally. 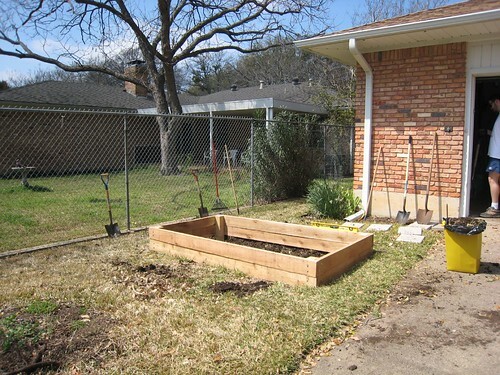 I want mine to eventually look like my untreated cedar fence. My dad suggested using lag screws instead of wood screws, and I think it much improved the structure and look of the box. Lag screws have a hexagonal head. They are sturdier, and you are less likely to encounter stripping problems wood screws might present. I also used washers. I bought galvanized hardware because that type doesn’t rust. You will need a lag driver attachment for your drill, and you’ll need a socket wrench to tighten the screw all the way. My screwdriver would get the job almost done, but then I had to finish it with the socket wrench. Err on the side of having posts that are shorter. Then you won’t have to dig as big of a hole. Removing the grass and digging the posts will take a LONG time. As long as building the box. That last suggestion will be the first part of my second post on this topic, yet to be written about how to set the structure and fill it up. Check back for updates on how the garden’s going!!! A profile I wrote about concrete craftsman Frank Clements ran in Friday’s Home section of the Dallas Morning News. 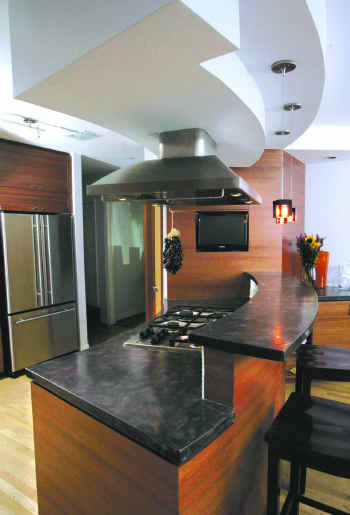 This is one of his counters, in a remodeled kitchen in the Little Forest Hills neighborhood. What makes Frank’s work different are his carpentry and finishing skills. He is trained in building fine furniture, and he uses what he knows about building odd wood shapes and about painting/staining/coating to create really unique and special concrete surfaces. Scribd: This is the flickr of online documents. It’s the place to go to post and store files and eBooks so that they can be read in an easy format. It aims to fill the void between printed documents web pages. No formatting limits, everything is stand alone. Seems like it would be good for theses and academic publications. I found this document about Google Analytics on Scribd and will be reading it to understand exactly who you — the people reading this post — really are. Google Book Search: Well it’s about time Google took over books too, don’t you think?!?! Google’s book area contains a compilation of all the information about a particular book. I searched for Peter Reinhart’s book The Bread Baker’s Apprentice, and it showed me all my eBook options, PLUS (here’s the super cool part) a link to find the closest library that carries the book! I clicked the library link and it retrieved the book’s call number info for the Dallas Public Library. Awesome! Does anyone out there still go to the regular library anymore? I am a big fan of the downtown Dallas central branch, but I hardly ever see young professional looking people down there. Please comment about your last library experience!! 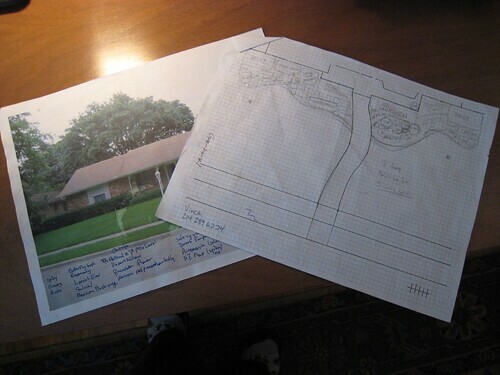 Landscape Plans, originally uploaded by espeedy123. Newsweek’s Tip Sheet blog has a post this week about the growing popularity of garden coaches. These are people who offer advice and answer questions about landscaping. 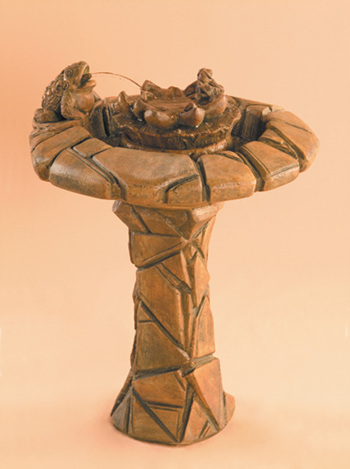 Their rate and scope of service is less than that of traditional landscape designers. It seems like garden coaches may be replacing a service that plant nurseries used to and should still offer their customers. This winter I started overhauling my front landscape, and before finalizing the plan I sat down for a consultation with a “grow coach” at North Haven Gardens. A one-hour sit-down session costs $50, but then at the end of the session you get a $50 gift card, so it’s a wash. I came prepared with photos and sketches. I left with some good advice that ultimately changed some pretty big elements of my original design. The plants at North Haven seem more expensive than average, so the price of that advice is built in to what you buy. It seems they have just formalized the value relationship of sales and service. Initially I asked for similar advice about my plans at Rohde’s and Calloway’s. I would have been happy to spend my $50-plus there, but each of them passed me off. I am curious about other people’s experiences with premium nursery service. Is it in decline? Am I really better off at Home Depot?